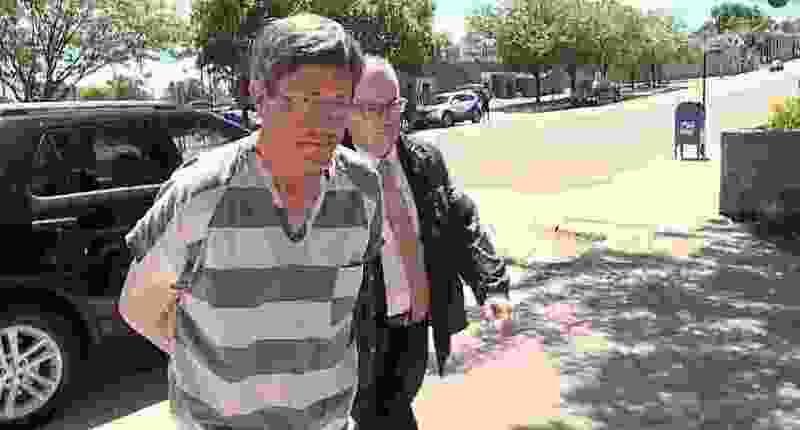 (Courtesy KSFY) Lyle Jeffs is seen on Thursday, June 15, 2017, after his arrest in South Dakota. Federal prosecutors want a five-year prison sentence for a polygamous sect leader who pleaded guilty in a food-stamp fraud and escape case. Prosecutors argued in court documents filed Friday that Lyle Jeffs should serve the maximum sentence because he ran the scheme to divert some $11 million in food-stamp benefits to a communal storehouse and front companies. Defense attorneys have said those charged were following religious beliefs in communal living. Cases against 10 other defendants have ended in plea deals without prison time or dismissed charges. Jeffs is set to be sentenced Dec. 13. He pleaded guilty to conspiracy to commit benefits fraud and failure to appear.He has also agreed to pay $1 million in restitution. The 57-year-old Jeffs was arrested nearly a year after he escaped home confinement while awaiting trial in the food-stamp fraud case.